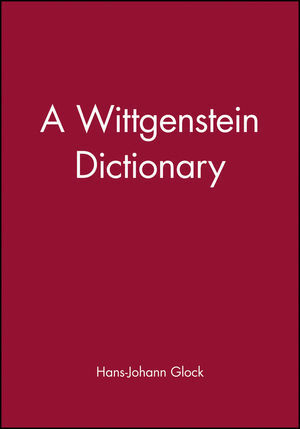 This lucid and accessible dictionary presents technical terms that Wittgenstein introduced into philosophical debate or transformed substantially, and also topics to which he made a substantial contribution. Hans-Johann Glock places Wittgenstein's ideas in their relevance to current debates. The entries delineate Wittgenstein's lines of argument on particular issues, assessing their strengths and weaknesses, and shed light on fundamental exegetical controversies. The dictionary entries are prefaced by a "Sketch of a Intellectual Biography", which links the basic themes of the early and later philosophy and describes the general development of Wittgenstein's thinking. Extensive textual references, a detailed index and an annotated bibliography will facilitate further study. Authoritative, comprehensive and clear, the volume will be welcomed by anyone with an interest in Wittgenstein – his life, work or influence. Each Blackwell Philosopher Dictionary presents the life and work of an individual philosopher in a scholarly but accessible manner. Entries cover key ideas and thoughts, as well as the main themes of the philosopher’s works. A comprehensive biographical sketch is also included. Hans-Johann Glock is Professor of Philosophy at the University of Reading. He has been Visiting Professor at Queen's University, Ontario and a research fellow of the Alexander von Humboldt Foundation at Bielefeld University. He is the author ofQuine and Davidson (2003); editor of The Rise of Analytic Philosophy (Blackwell 1997), Wittgenstein: A Critical Reader (Blackwell 2001) Strawson and Kant (2003); and co-editor, with Robert L. Arrington, of Wittgenstein's Philosophical Investigations (1991) and Wittgenstein and Quine (1996). Notes on the use of this book. System of reference and primary sources. Sketch of an intellectual biography.